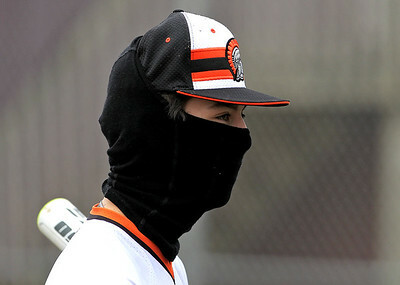 H. Rick Bamman - hbamman@shawmedia.com McHenry's Bobby Milller is bundled up during the first few innings of the game Wednesday, March 29, 2017 against Hononegah at Fred Meyer Field at Peterson Park in McHenry. For more on the game turn to Sports. Thursday's weather is expected to be cooler and breezy with periods of rain according to the National Weather Service. H. Rick Bamman - hbamman@shawmedia.com McHenry's Michael Lasiewicz pitches in the second inning Wednesday, March 29, 2017. Lasiewicz and Dylan Honkala combined for 12 strike outs and 2 hits in the Warrior's 1-0 win over Hononegah. H. Rick Bamman - hbamman@shawmedia.com McHenry's Bobby Miller catches an infield fly ball for the out in the third inning Wednesday, March 29, 2017. 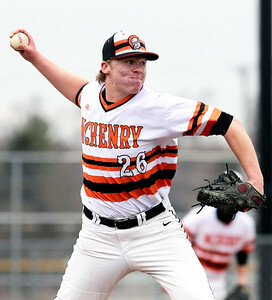 McHenry shut out Hononegah 1-0. H. Rick Bamman - hbamman@shawmedia.com McHenry relief pitcher Dylan Honkala throws in the seventh inning Wednesday, March 29, 2017. Honkala and starting pitcher Michael Lasiewicz combined for 12 strike outs and 2 hits in the Warrior's 1-0 win over Hononegah. 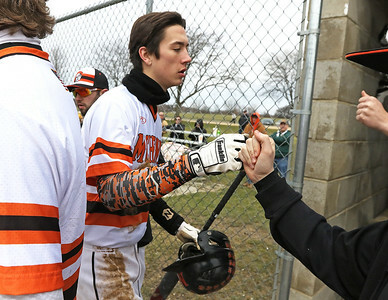 H. Rick Bamman - hbamman@shawmedia.com McHenry's Bobby Miller is welcomed to the dug out after scoring the run off the hit by Jared Wojcik in the Warrior's 1-0 win over Hononegah Wednesday, March 29, 2017. 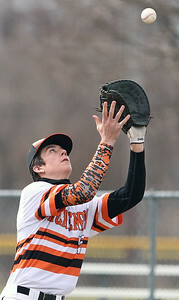 H. Rick Bamman - hbamman@shawmedia.com McHenry's Owen Patzin fields a ground ball in the third inning in the Warrior's 1-0 win over Hononegah on Wednesday, March 29, 2017. H. Rick Bamman - hbamman@shawmedia.com Diving McHenry short stop Owen Patzin misses a screaming grounder in the seventh inning Wednesday, March 29, 2017. 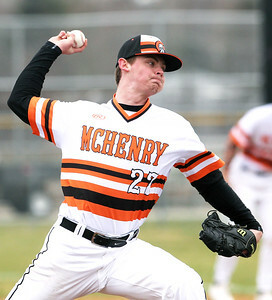 McHenry shut out Hononegah in the 1-0 win. 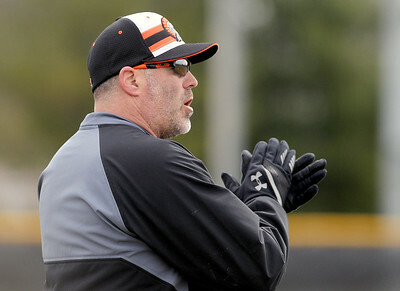 H. Rick Bamman - hbamman@shawmedia.com McHenry's head coach Brian Rockweiler appalds his team's defensive effort Wednesday, March 29, 2017 during the Warrior's 1-0 win over Hononegah. 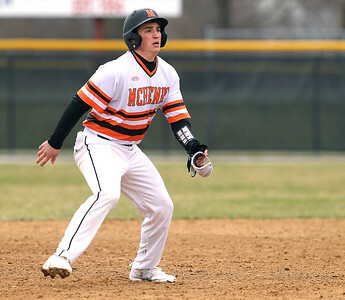 H. Rick Bamman - hbamman@shawmedia.com McHenry's Jared Wojcik takes his lead off from second after hitting a double in the fourth inning and scoring the only run in the Warrior's 1-0 win over Hononegah Wednesday, March 29, 2017. McHenry's head coach Brian Rockweiler appalds his team's defensive effort Wednesday, March 29, 2017 during the Warrior's 1-0 win over Hononegah.